The group UFOIC has had a long complex and fascinating history. 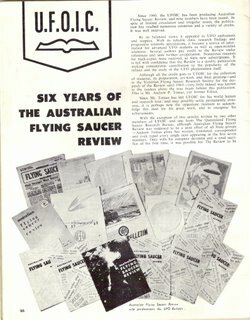 It emerged out of the original Australian flying saucer group, pioneer researcher Edgar Jarrold's Australian Flying Saucer Bureau (AFSB), based in Sydney, New South Wales (NSW). Andrew Tomas joined AFSB in January 1954. The group attracted future UFOIC members such as Dr. Clifford and Dr. Miran Lindtner. 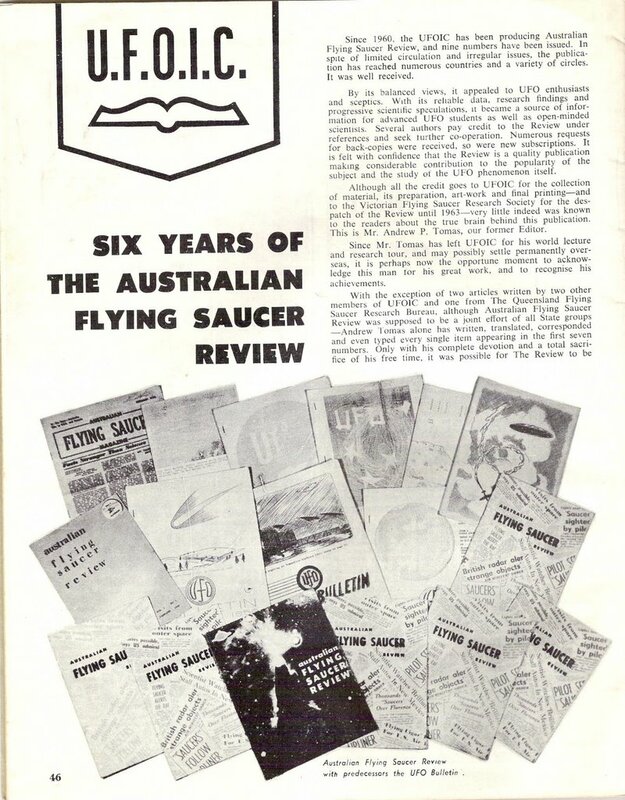 With the departure of Edgar Jarrold in curious circumstances, Andrew Tomas reorganised the remenants of AFSB as a NSW state branch of Fred Stone's Adelaide based Australian Flying Saucer Research Society (AFSRS). In November 1956 the UFO Investigation Centre (UFOIC) was formed from this history, with Dr. Clifford serving at its first president until December 1958. Dr. J. Greenwell was briefly president, then Dr. Miran Lindtner took up the group presidency, continuing an energetic and dynamic period of research and investigation, until his untimely accidental death in 1969. Fred Phillips took over as President in this difficult time. The group went into a bit of a decline but by 1973 it had been reorganised and energised under the leadership of David Buching. By 1975-76 Michael Smyth and I were cordinating the groups activities. In line with some other state groups, we adopted the group name UFO Research, with a NSW identification - UFO Research (NSW). By the early 1980s the group was reconfigured, adopting a networking type approach, rather than continuing the traditional public group format. This change worked well with a good working relationship with the national networking organisation ACUFOS - the Australian Centre for UFO Studies - and later with UFORA (UFO Research Australia) when ACUFOS became a shell of its original self. 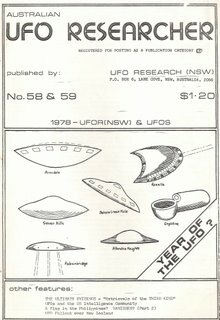 The original UFOIC name was readopted in 1991 when a name change was forced by a new group registering the UFO Research (NSW). 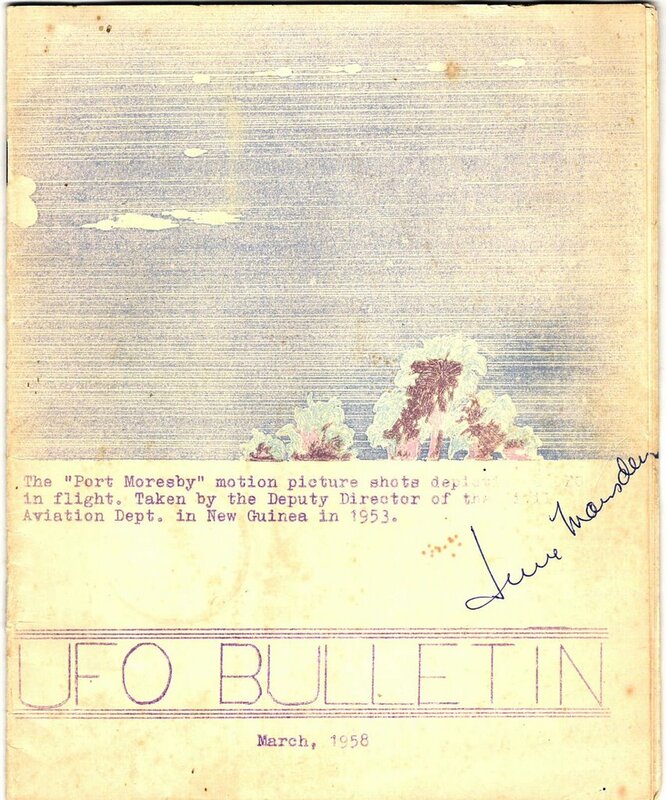 UFOIC continued its research and investigation, preferring a successful model of a "low profile" active network, rather than a public relations group format. This approach has served the group well and continues today under my direction. 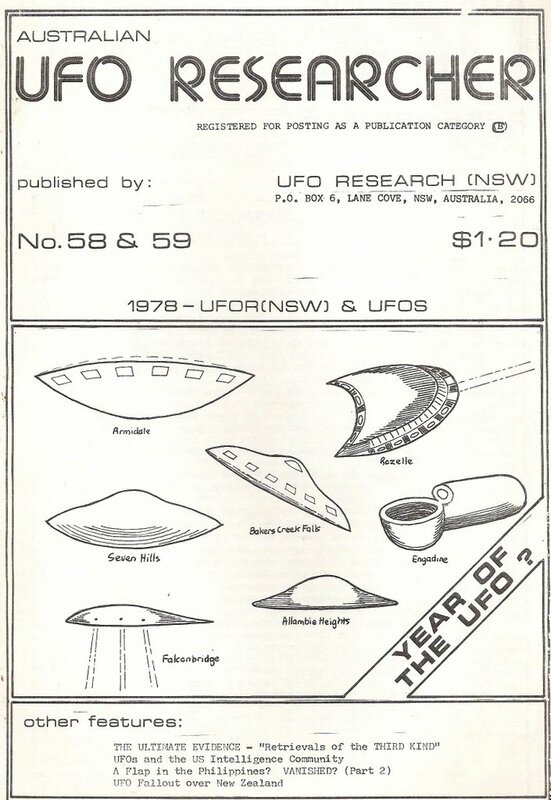 I originally joined UFOIC back in the late 1960s as a country member, joining the committee in 1975 when I moved to Sydney. This brief outline of the history of UFOIC reveals a complex but fascinating evolution, driven by changing research and investigation strategies and focuses. Many striking UFO cases have been undertaken by the group during its rich history. 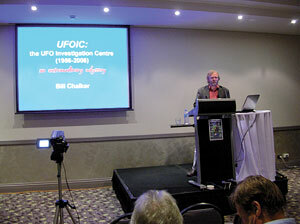 UFOIC has made a potent contribution to UFO investigation and research in Australia. 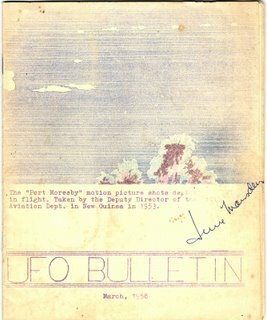 I am currently researching a history of UFOIC and would welcome contact and contributions to this effort from past members and observers of the group. 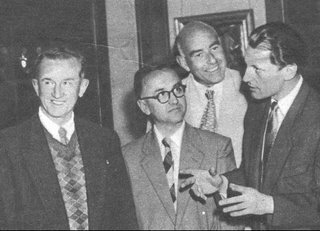 Photos: Bill Chalker lecturing on UFOIC's history in May 2006; UFOIC in 1957 - (right to left) Dr. Miran Lindtner, Fred Phillips, Andrew Tomas & Gordon Deller (People, 1957); UFOIC publication - UFO Bulletin March 1958 illustrating "the holy grail of Australian ufology" - the famous 1953 PNG Drury UFO film incident; UFOIC - six years of the Australian Flying Saucer Review; one of the 1978 UFOIC/UFOR(NSW) publications I edited. One of the most interesting books I have read recently is "TREADING LIGHTLY The hidden Wisdom of the world's oldest people" (2006) by Professor Karl-Erik Sveiby (a specialist in Knowledge Management) and Tex Skuthorpe (an aboriginal Nhunggabarra cultural custodian). The book represents "a unique journey into traditional Aboriginal life and culture, and offers a powerful and original model for building sustainable organisations, communities and ecologies. It is a compelling message for today's world. "This central message of the book is well worth your time to explore. Indeed it is of vital importance. 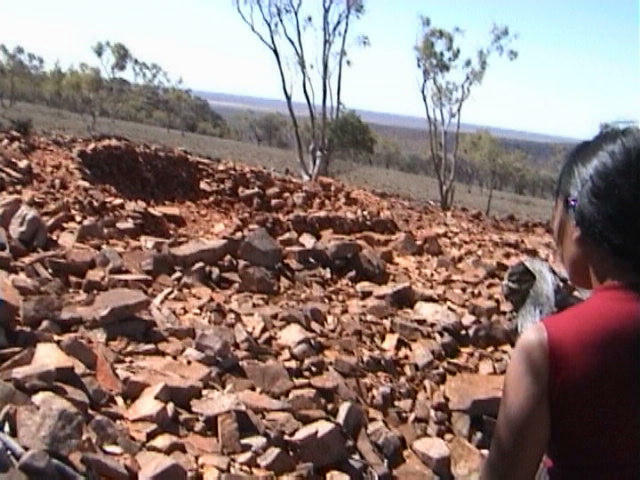 The different explorations of Karl-Erik Sveiby and I intersected rather unusually in 2004 when he approached me and researcher Steve Walters to get our opinions on a strange photographic anomaly - a possible aerial anomaly - he had recorded during April 2004 at Mount Oxley near Bourke New South Wales while in the company of Tex Skuthorpe and his partner. Karl-Erik presents the unusual photo in the book as a possible manifestation of the Fourth Level of meaning in aboriginal stories - the spiritual realm. 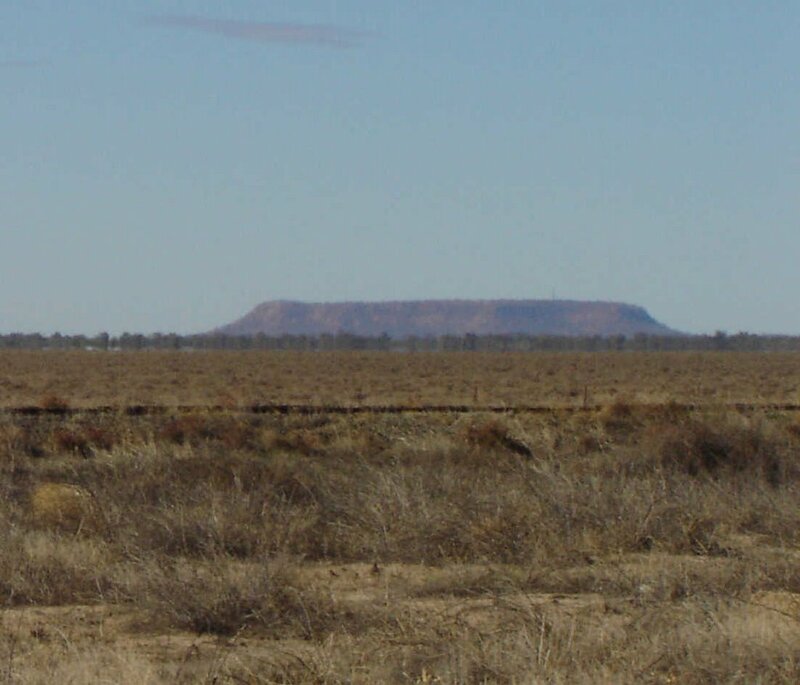 Through the fascinating aboriginal story of How the Nhunggabarra got flowers Mount Oxley (or Wubi-Wubi) was a focus of shamanic contact between aboriginal men of high degree (or wiringins) and the ancestral being Baiame (Baayami) . Mount Oxley had already become an interesting place for me. 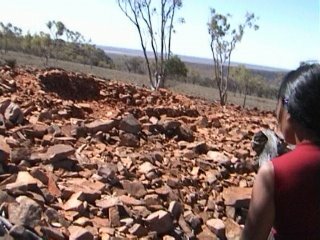 I visited it back in September 2003 exploring its fascinating sense of presence and its enigmatic lore of strange phenomena. I was already aware of the legend of the flowers through the renderings of K. Langloh Parker of local aboriginal tales she collected in the late 1890s and it was fascinating to see the story retold through the words of local custodian Tex Skuthorpe and its "Fourth Level" of meaning, and its beautiful evocation through Tex's great paintings. While prosaic explanations may be evident for the photo anomaly Karl-Erik recorded it is fascinating to consider the context he and Tex explore in their important book. I certainly do not want to distract from the central message of "Treading Lightly" given its significance as a potent intersection between a remarkable old culture and modern knowledge management theory. The book and its message is worth your detailed exploration. 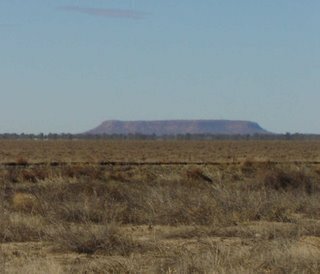 Photos: the mysterious rock "craters" on Mount Oxley (September 2003) and Mount Oxley in view (photos copyright Bill Chalker). Denise Blazek of Ghost Radio has a knack for doing a hell of a good interview. Check out her archive of interviews at http://www.ghostradiox.com/phantom/archives_blazek.asp Denise's interview with me, which focused on the breakthrough case of the Peter Khoury 1992 experience featured in my book "HAIR of the ALIEN - DNA and other forensic evidence of alien abduction" was originally aired on Ghost Radio on May 21, 2006. I am sure you will find this interview and the others on the site of interest.